Multi-Device On-Ear Wireless Headset System. Singular Control. The Savi® W730 is changing the way productivity-focused office professionals communicate. 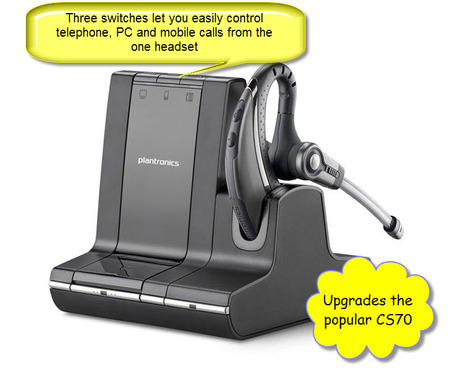 With three-way connectivity, easily manage and switch between PC, desk phone, and now mobile2 calls from a single wireless headset. All this with a 100 metre operating range. Consists of a standard Plantronics Savi WO2 base and a WH210 on-ear headset (complete with charging station). Only weighs 25 grams. This intelligent system combines best-in-class sound quality, hands-free mobility and 6 hours of talk time for ultimate efficiency. Once you experience a Savi W730 headset system you’ll wonder how you ever lived without it. G616 hearing protection compliant, provides additional protection against acoustic shock. 3. The battery in this headset IS NOT USER REPLACEABLE.